Cornerstone Academy offers more than child care in Kenosha, WI. We also specialize in early childhood development and education in our preschool program. Our program aims to educate toddlers on how to read and understand basic math concepts. We have complete confidence in our curriculum but always appreciate help from parents at home and we know children do too! Don’t miss our post featuring tips on how to teach your preschooler to read at home. 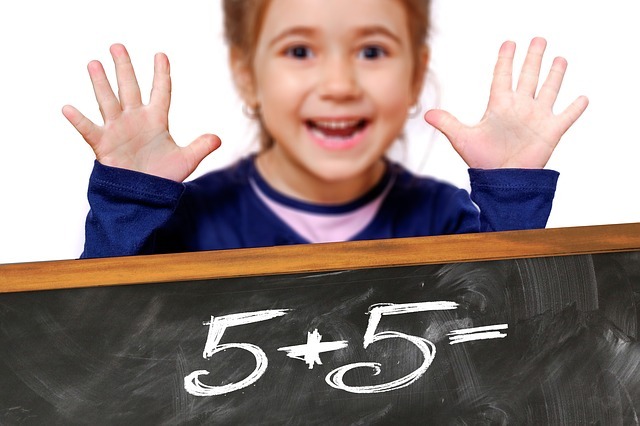 Today, we will provide some helpful ideas on ways to teach your preschooler math at home. The good news is you don’t need a degree in mathematics or even any learning materials to help teach your child math at home. You just need patience and common household items you already own. Games and other hands-on activities are more than enough to aid in your child’s understanding of basic math concepts and prepare them for kindergarten and future math classes. In order to understand math, toddlers first need to understand the concept of “more” or “less”. This is something parents can help with at home that is very easy to do. Place some cookies or apples or another food item in front of your child. Then add more of the item and ask your child if there are more or less of the item in front of them. Then remove a number of the items and ask the question again. Continue with this exercise until you feel your child is able to understand the concepts of “more” and “less”. Does your child understand one-to-one correspondence? Toddlers often know how to count to 10 or to 20 but often don’t understand that each additional number or item is one more or in addition to. You can help toddlers understand this by placing a certain number of apples or bananas or another food item in front of them and then have them count the total. Then add two or three more of the pieces of fruit or food. Does your child continue counting from where they left off or does he or she restart at “1” and count all over again? Encourage your child to start from the number he or she stopped on in order to help them understand simple concepts of addition and one-to-one correspondence. Patterns are a key component for understanding math. Toddlers should learn how to identify patterns and even create their own patterns in order to grasp other mathematical concepts. To test your child’s ability to create patterns, provide them with three of the same object and three of another object and see if he or she can create a pattern. The easiest pattern to understand is every other where he or she will lay out the first object, then the second object, then another of the first object and so on. After your toddler is able to understand this pattern, see if he or she is able to identify or create a more complex pattern with the items provided. Sorting requires problem-solving which is a key element to succeeding in math exercise. Provide your child an assortment of items in various colors, shapes and sizes and ask them to sort the items. Let them sort them in whatever way they choose. You might notice them sorting the objects by size or by color. After they are done ask about how they decided to sort the items and whether or not there are other ways the items could have been sorted too. Identifying shapes is a core component to understanding geometry later on in childhood. You can find various shapes throughout your home or create shapes with cookie cutters or cut out shapes from pieces of paper. You can also use these shapes for your sorting project or for helping your toddler understand and create patterns. Don’t try to teach to much to your preschooler at once. Casually incorporate math into your routine at home and it won’t feel like a chore for your small child.